This post contains affiliate links. If you choose to shop through these links, you have our thanks for supporting the blog! 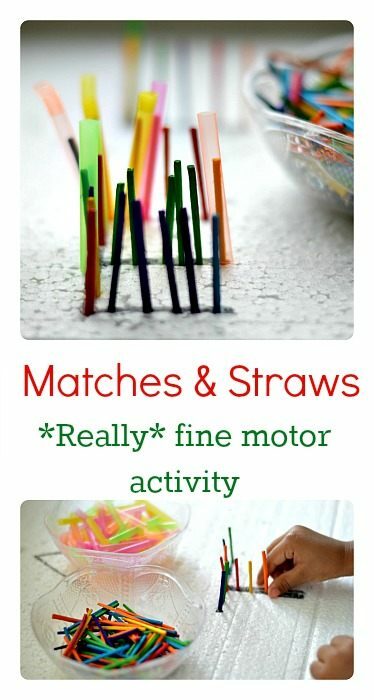 Just like this exercise, fine motor activities are a great way to extend your child’s current interests. 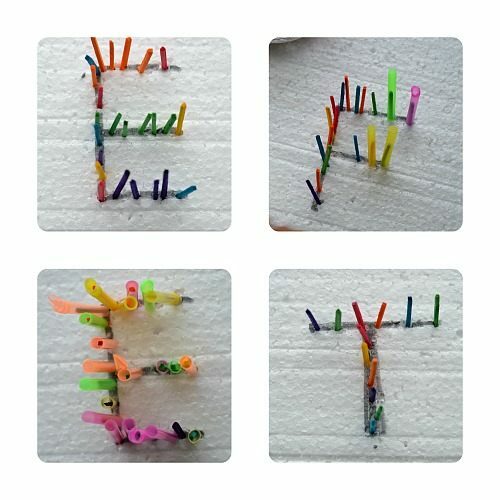 We are working on pre-writing, so I set out those letters and observed if she would be interested in making the letters. 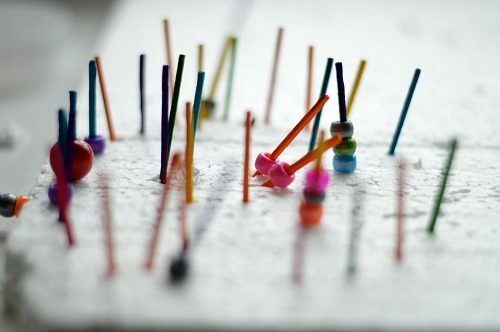 I showed her to follow the lines and start poking the matches on the lines. You could mark arrows to make this more of an independent activity. Since this fine motor activity was supervised, neither did I draw arrows nor was worried about the matches. 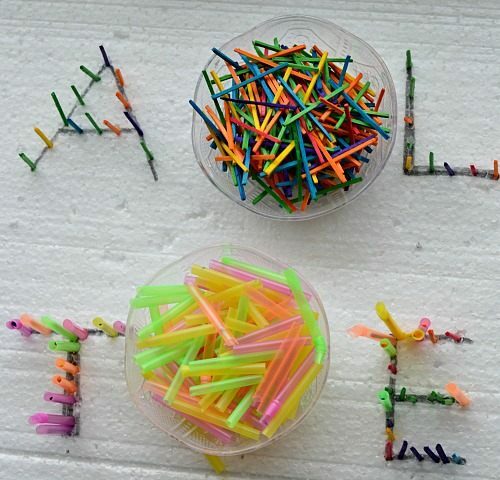 I thought the blunt edges of the colored matches were a better alternative to sharp toothpicks. The brightly colored matches definitely helped my kid get really interested in this invitation. 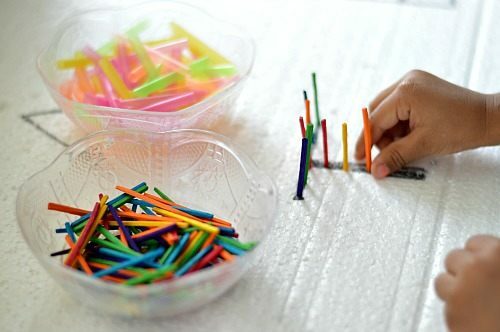 Next comes the best part – something that makes this fine motor activity a killer of a real fine motor activity. 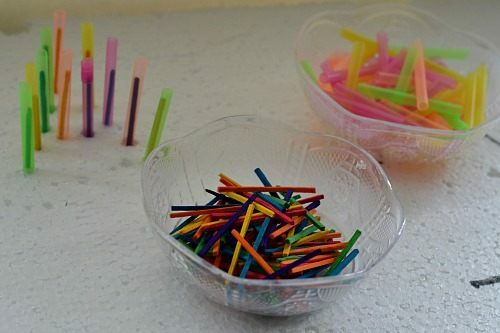 She inserted the cut up straw pieces on each of the colored matches. What a work out! Hand-eye co-ordination at its best. I should tell you, the letters after all “strawed-up” looks absolutely stunning like a cool construction project. 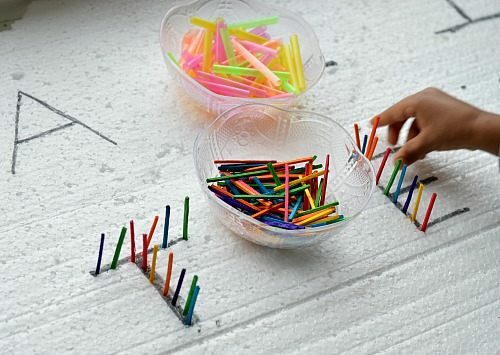 Inserting the straws into the matches was a challenge- a challenge that was gladly accepted and eagerly accomplished. 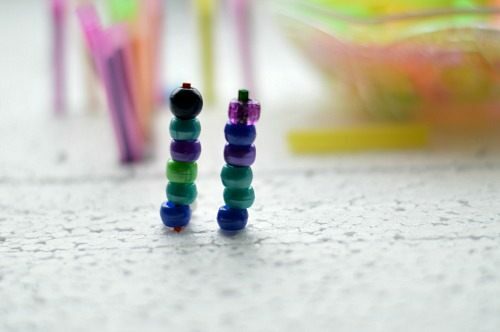 Once fine motor practice and pre-writing interest wore off, the children ( now big sister 5 joined) decided to create small worlds with matches and beads. 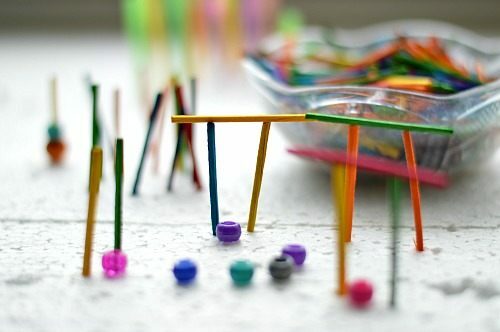 It involved a lot of poking and threading through the sticks. Apparently it is a stick world and the one with the beads are people and the rest are buildings and trees. 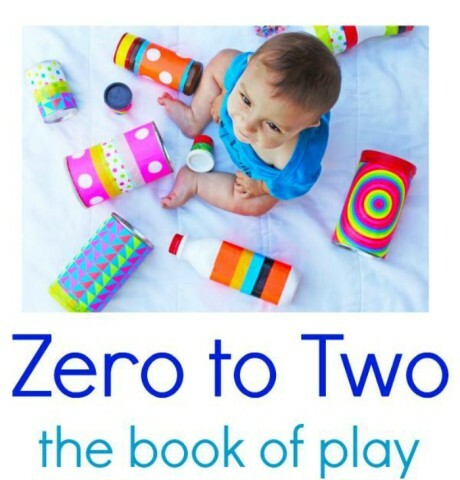 So much creative play, fine motor play and small world went on and these 2 cuties are actually sisters playing around. Very creative construction projects here which required an amazing amount of patience and concentration from the 5 year old. 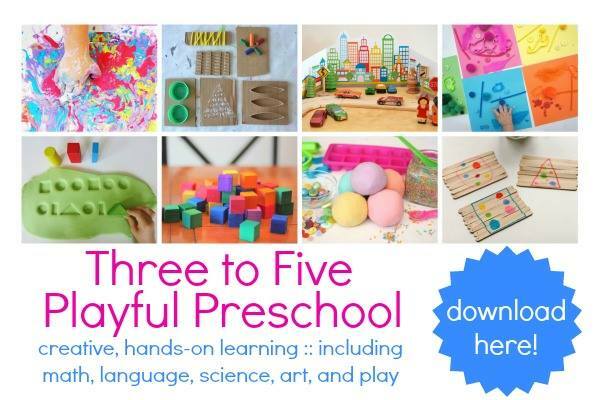 I highly recommend this activity for encouraging so many areas – fine motor skills, math skills, pre-writing skills, imaginative play skills. 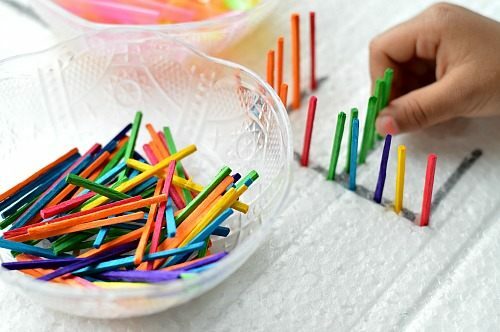 Note: While colored matches are not as sharp as toothpicks and relatively safe, still supervise your children while they are engaged in these type of fine motor activities. 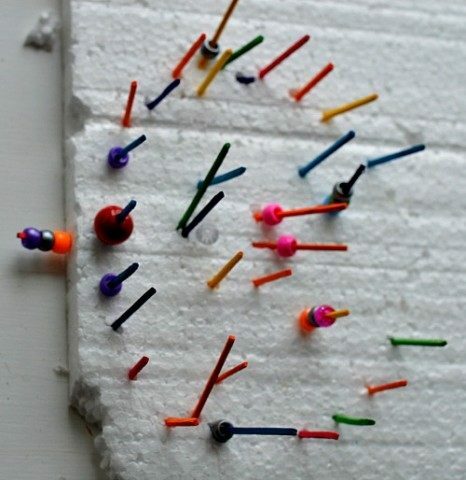 Wow what a clever good looking idea!! Now to find a piece of this foam board. Amazing. Love it! 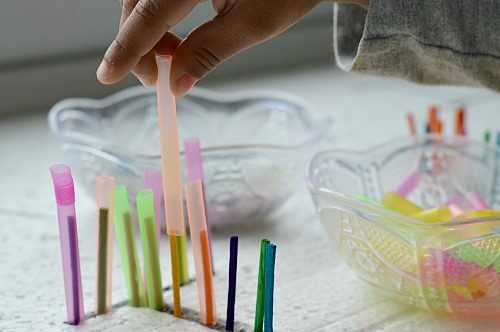 I cannot even tell you how much I LOVE this activity! 🙂 I cannot wait to try it out in my preschool classroom. I know the kiddos are going to have a lot of fun with it. 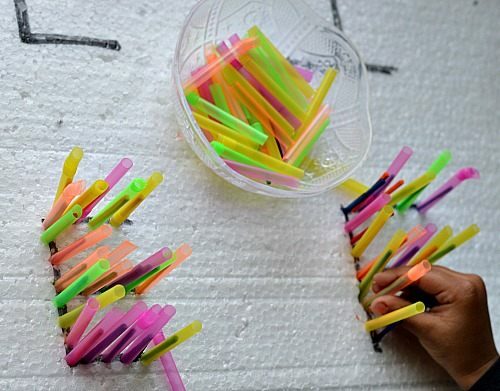 What a fun use for straws and styrofoam!